Then you learn more about components and how to build them. 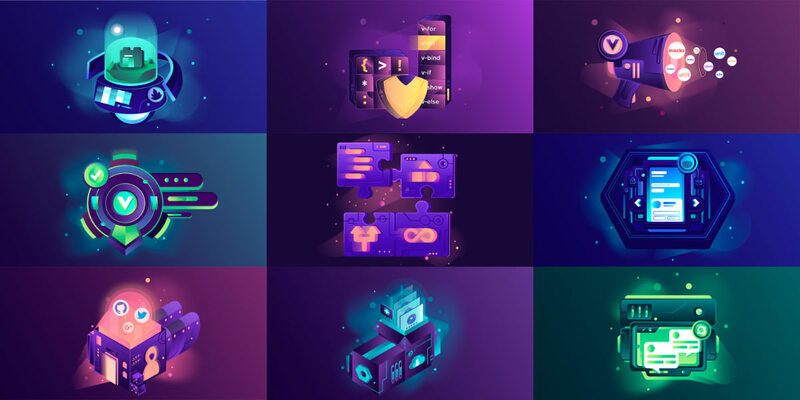 You start creating your own components, combining them and applying different communication patterns in order to build more complex components. Sure you're doing great and keep the components as small as possible so you can reuse some of them in several places of your application. But at some point, the application grows. You have many components and things are starting to get messy: it's hard to find the right component and to know its responsibility, then maintainability starts to suffer. No worries, in this article we're going to see different ways and tips you can use to structure your application components. In component-based technologies, everything is a component. Having a fact like that, we must think about a way to categorize them. 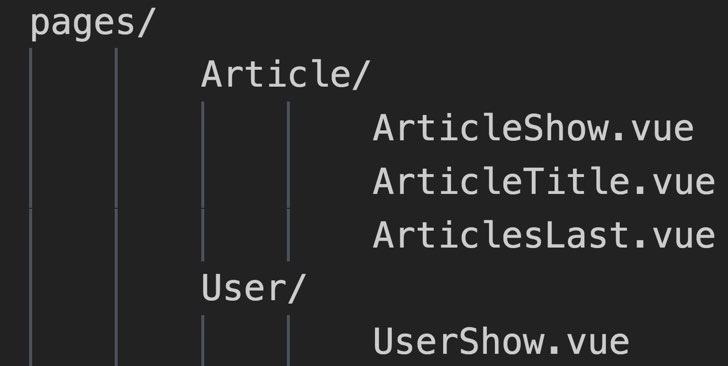 That's an easy split and already gives us a bit of structure, so that when we know where to place and search for pages components. However, a page is usually composed by more components or sections. Related to the ArticlePage, we see the ArticleTitle, ArticleList and LastArticlesSection components. Let's assume ArticleTitle and LastArticlesSection are meant to exist only in the ArticlePage, but ArticleList is a component that fetches and renders a list of articles, and it can be used in multiple places. It will be imported it from pages/ArticlePage.vue or pages/ArticlePage/index.vue. For that reason, we can always start creating the pages as a component and later move it to a folder without having to change the way to import it, making refactoring easier. We still have components with mixed responsibilities and domains in the components folder. There is another split point on UI components: those that are reusable across the whole app. They communicate just by using props and events, not holding any application logic. What about the ArticleList component? We can have components that are reusable in different pages, so we shouldn't place them with the page components. However, they belong to a specific domain, in this case to the article domain. Lastly, what about the rest of the components? There can be components that belong to no domain, are not ui or layout. They can be some kind of utility components that have some logic but delegate the rendering to children components. For example, imagine an Observer component that detects when its children intersect on the screen. Another example is vue-no-ssr: a component that renders its children only when it's running on the client, in case you're applying Server-Side Rendering (SSR) or you're using Nuxt. We've seen different techniques to structure your application components. They might be helpful for you or not, but I hope at least you got some ideas that you can use from now on. That’s generally a better structure than what my apps have evolved into. One thing I do that I think works well though is the use of a “components/super_components” folder. My distinction between a regular component and a super component is a super component is one which makes its own ajax calls to get state instead of merely pulling in props. With that distinction I can quickly see which components will work well all on their own (just by passing props into them), and which ones are dependent on the server API (and therefore operate on their own). I’m not sure if this is what’s considered best practice, but it works well for me. I always use an own made ajax method wrapped as a promise, but abstracted in a function like this ajax(url, type, data); Where url = url/route, type = get,post,put,delete, data = data u want to post and/or the callback data from the server like in a ‘get’ request. Yeah my ajax calls are abstracted into getters and setters as well, but my distinction between regular components and super components is that regular components will only get data though props, and output through $emit. Super components may also use the ajax getter/setter methods. That way when you’re looking at a super component you know that you’re not dealing with a pure functional component and there will be side effects. This is a good recommendation. I use views instead of pages. I also do not typically use any sub-folders inside my views or components directories, which makes it easier for type hinting and import statements. I just use the style guide suggestions for naming. Look at the Atomic design. It has a similar approach. The module resolution you used for ArticlePage/index.vue doesn’t work in my application, I see that the import for index.js in a folder works, but not for .vue file (component), does it require any changes to the webpack config in order to enable this? 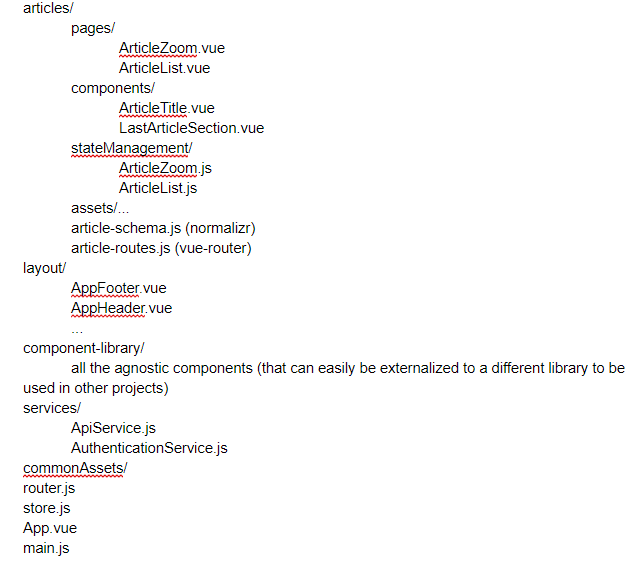 it seems that ‘components/article/AppList.vue’ is supposed to be ‘components/article/List.vue’ at the end by the article, right? I’m not sure it’s perfect yet, but certainly better than what I had before.